Preheat oven to 375°. Butter 9” baking dish; set aside. Cut cauliflower into florets, reserving the core, but discarding green parts. Cut core into small pieces, keeping them separate from florets. Blanch or steam florets until tender; transfer to ice water to stop the cooking process. Drain and set aside. Blanch or steam core pieces until tender and transfer to blender. Add just enough hot water to puree; transfer to large bowl. Stir in cream, and season to taste with salt, pepper, nutmeg, and cayenne. 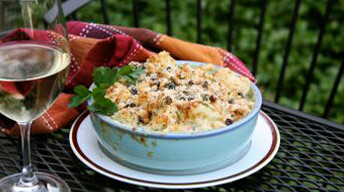 Add cauliflower florets and half of the cheeses; stir to combine. Scrape into prepared baking dish and top with remaining cheese. Bake until cheese is bubbly, golden brown and cauliflower is heated through. Top with breadcrumb mixture. Heat currants and sherry in small, non-reactive sauce pot; simmer until liquid is gone. Combine remaining ingredients in bowl and toss to combine. Pour out onto a baking tray and toast in oven until golden brown. Remove from oven to cool; toss with currants.